Philadelphia Eagles center Jon Dorenbos (46) watches the game against the Green Bay Packers at Lambeau Field. 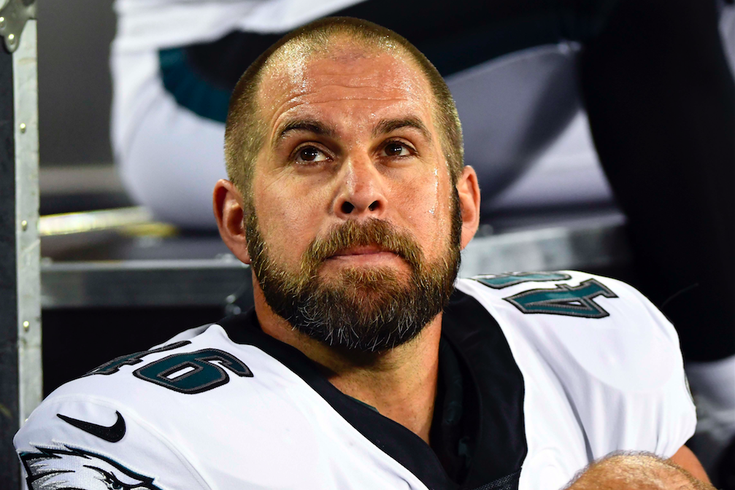 Jon Dorenbos is finally getting a Super Bowl ring, thanks to Philadelphia's upset win in Super Bowl LII on Feb. 4 and a touching gesture on the part of Eagles owner Jeffrey Lurie. But the Eagles' first Super Bowl title will also jumpstart the film being made on Dorenbos' made-for-Hollywood life story, focusing on how card tricks and magic helped Dorenbos overcome a childhood tragedy. The film's producer, Philadelphia native Mike Tollin, told Deadline.com this week that the Eagles' upset victory over the New England Patriots put the film on the fast track. Tollin and Dorenbos agreed on a deal that gives Tollin life rights and an option for Life Is Magic, a memoir Dorenbos is writing alongside former Philadelphia Daily News editor and current Philadelphia Citizen co-executive director Larry Platt. Dorenbos used a developing knack for card tricks to help cope with the death of his mother, who was beaten to death by his father during an argument at their suburban Seattle home in 1992. Dorenbos was 12. Dorenbos garnered national attention when his magic act made him a surprise finalist on NBC's America's Got Talent in 2016. A 14-year NFL veteran who spent 11 seasons as a longsnapper with the Eagles, Dorenbos was traded to the New Orleans Saints last August. As it turned out, an aortic aneurysm was discovered during a follow-up physical with the Saints after the trade, and he soon had surgery in September to repair it. Dorenbos told PhillyVoice in November that had he not been traded and given that physical, he may have died during the most recent NFL season. Tollin told Deadline he's looking for a writer to work on the film and is already in talks with an A-list star, presumably to play the lead role. The film does not yet have a title. The report also noted that Tollin hopes the film can repeat the success enjoyed by "Invincible" (2006) and "Silver Linings Playbook" (2012), both of which were Eagles-centric films based on an underdog tale. Tollin hopes to have the film out in about a year, according to the report. Or, as Tollin wise-cracked, when the Eagles defend its NFC championship crown next January.